Someone once told me, “if you want to be a winner, you’ve got to think like a winner.” Yes, but how do winners think? It all starts with them asking themselves, “where am I going?” In answering this question they decide: what they’re going to be the best at. This could be business, TV personality, sport, comedy, medical research, farming or maybe even politics. Once they have chosen their field, they then drill down to something specific. For example: farming strawberries, hockey goal minder, technology company director, political foreign policy and so on. Once a winners have decided on their area of specialisation they set out to learn everything they can about their subject. They research, they read, they watch videos, they attend lectures and workshops, and they write about their subject in order to deepen their knowledge. They set themselves the standard of being excellent at what they do. Then they study how the best people in their area behave. In particular they watch how they behave in crunch moments when they really have to be at their best. Only when a winner knows what the existing best people do can they start to fine-tune their own performance to emulate the best in their field. Winners practice being in the present. They do this for two reasons. One, they realise that much time is lost worrying about what might happen in the future. They don’t want to waste their time in this way, so they focus on what is going on right now and on making things happen immediately. Second, they know that the achievement of excellence demands one hundred percent concentration on what they are doing. They practice mind control as a discipline because they know that when they are in charge of their mind they are also in charge of their feelings. Control of feelings enables them to channel their energy precisely where it is needed. As you can see there is nothing particularly difficult about what winners do. What makes them different is the dedication, persistence, determination and desire with which they do it. Some winners have a talent for what they do, but talent alone is never enough. The pages of history are littered with examples of people with talent who squandered the jewel with which nature had endowed them. To join the ranks of the winners all you have to do is: decide where you are going (make it specific), learn everything you can about your subject, study what the best in your chosen field do and how they do it, and practice focussing all of the time. Then just want it so much that everything else becomes irrelevant. You can learn a lot more about this from my book Create The Life You Want. or you might like to attend a Discover Your Passion 1-day workshop to help you clarify what you really want to do with your life. Don’t miss our future articles – just enter your email address in the form at the top of the right hand column and I will notify you whenever I write a new article to help you create the life you want. Anxiety can strike at any time, but you can always manage anxiety. It often arises when we really want something, or when we want to make a good impression. It can turn you from “confident that you can seize an opportunity” into “nervous and uncertain about your ability” in an instant. But, is there anything you can do to manage anxiety? Do you, like me, you sometimes find yourself in a situation like this – you are cruising along, imagining that all is well and what you are about to do will work out fine, when suddenly you are attacked by anxiety? This happens at a crucial moment, just as you are about to perform, as a result uncertainty and nervousness inhibits your performance – damn! Is there anything you can do? Of course taking deep breaths always helps. This is because deep breathing oxygenates your blood and helps you to relax. 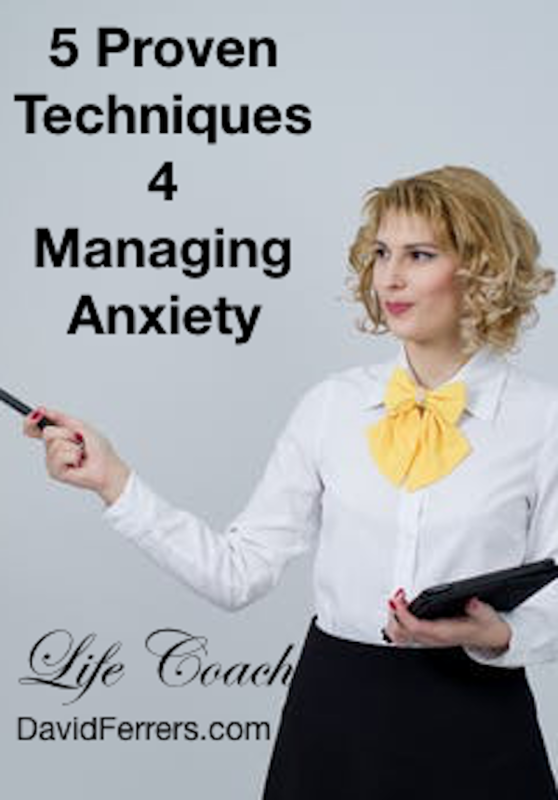 But in this article I want to take anxiety management to a higher level – a much more effective level. Let me say, as a life-long sufferer from anxiety, that I have not yet found a way to prevent anxiety from occurring. However, I have found an effective way of managing attacks when they happen. The first point to bear in mind is that you cannot keep two thoughts in focus at the same time. For instance, you cannot think about a jam sandwich and a double-decker bus simultaneously. Try it. Your mind will switch from one to the other, but it cannot visualise both at exactly the same time. This is useful because it means that you cannot think about being anxious and being confident at the same time. So the first way to manage anxiety is to focus on an image of yourself when you are confident. The second point is that your feelings all start as thoughts. You have to experience or think of something sad in order to feel sad. You have to see or think of something horrific in order to feel horror. You have to hear of think of something exciting in order to feel elated. What this means is that your anxiety is always preceded by something that you are thinking about and that thought causes you to feel anxious. So, you need to change the image in your mind to an image of a successful outcome. Therefore if your feeling of anxiety started with a thought and you do not want to feel anxious, all you have to do is change your ‘anxious thought’ to a ‘confident thought’ and hold on to that confident thought. Of course this is easier said than done because anxiety tends to get a strong hold on us once it has arisen. However, there is a powerful way to conquer anxiety. The answer is always the same. These people are professionals. They have trained themselves by rehearsing how to handle pressure by using routines. Some goal kicking routines are very obvious, you see the player going through the exact same procedure before every kick. Soldiers also go though months of training before entering combat zones. But there is no reason why you should not use similar routines to overcome sudden attacks of anxiety. In my new book Create The Life You Want every chapter shows you a routine that will help you overcome the obstacles that you might encounter on the journey to becoming the person you can become. You don’t need to be hesitant or doubtful any longer. You can quickly develop your confidence to achieve anything that really matters to you. You can feel relaxed and happy all the time. All you have to do is develop routines. My next Discover Your Passion 1-Day Workshop will take you through the first step to using your natural talents and abilities to become the person you can become. It is on Sunday 12th November.